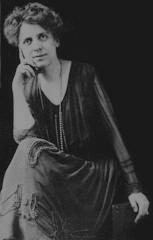 In July 1913, St. Louis housewife Pearl Curran began boggling minds the world over. While dabbling with a Ouija board at her apartment at 6031 Kingsbury Avenue, Pearl inadvertently summoned the spirit of long-dead Patience Worth. Patience, per Pearl, had come from England to America in the 1600s, where she’d had the bad fortune to be murdered in an Indian raid. Patience made up for her limited lifetime, however, by having a long and prolific afterlife. Not content with the usual table rappings and looking up of dead relatives, Patience began composing poetry. The media took notice. Before long, Patience had her own publishing contract. Pearl, who quickly discovered she no longer needed the Ouija board, started dictating Patience’s poetry, prose, and drama to her husband, John. Most of Patience’s works are out of print today, but thanks to the magic of Google Books (books from beyond the grave…), many are still available. After John Curran’s death in 1922, Pearl and Patience toured for a while, but the connection went fuzzy. Patience communicated less and less. Pearl retired and left St. Louis to live with a friend in California. Her death in 1937 was, of course, predicted by Patience Worth. As for the truth of Pearl’s claims… well, the jury’s still out. Pearl produced material so fast that even the most devoted skeptics had to wonder. But at least one magazine found Patience’s fictional counterpart in a novel from 1900. Pearl Curran’s building is apparently still standing. Any STL readers willing to venture out and send us pics? Please tell me if the photo is copyrighted or public domain. Thank you. I believe the photo of Pearl Curran is in the public domain. I couldn’t locate any copyright holder for it.